Conduct of latest DTTaS consultation raises concerns for future of rural cycling policy and for cycling tourism in Ireland. After the recent controversies in Galway about the behaviour of the DTTaS, TII (Formerly the NRA) and the two local councils in relation to cycling policy. A new consulation process was announced by Ministers Shane Ross TD and Patrick O’Donovan TD at a meeting with Galway Cycling Solutions in Dublin in January 2017. The consultation on the “Strategy for the Future Development of Greenways” emerged from the Department of Tourism, Transport and Sport (DTTaS) in late May. Unfortunately it was found to be flawed and the content reinforces serious concerns regarding the treatment of cycling and cycling tourism within the DTTaS. The structure of the document suggests that the department is still seeking to avoid or evade a model of cycling provision that is well-established and highly successful across Europe; using minor roads and tracks limited to local motor traffic. Galway is the premier model for this form of cycling provision in Ireland and this form of cycling tourism has been a central part of the tourism offering in Galway for decades. The use of minor roads is also a key component of Objective 3 on rural cycling in the National Cycle Policy Framework (NCPF). The greenway strategy asks if the use of low-traffic roads is something that should “also” be considered but does not mention this aspect of the NCPF. This strengthens concerns that under the current Government there is an active effort to set aside the NCPF. The Galway Cycling Campaign submission argues for a return to the well understood principles of the NCPF. What Ireland needs is a strategy for recreational cycling and cycling tourism in rural areas. What the DTTaS consultation announced was a “Strategy for the Future Development of Greenways”. Without further reading this title alone suggests that the DTTaS has again missed the point about cycling policy. Greenways or roads dedicated to cycling and walking (termed cycleways in Irish legislation) are an important component of a cycling strategy. However just as you cannot have a functioning roads network that consists only of motorways. Likewise you cannot have a functioning cycle network that consists only of greenways. The implication, and underlying assumption, of the proposed Greenway Development Strategy is that for many cycling will remain an activity that is accessed by car. Greenways or “Cycleways” cannot deliver full benefits for Ireland unless they are used as one component in a comprehensive network of routes linking destinations. Greenways are only one form of cycling provision. Other components in a cycling network will include roads shared with motor traffic, roads with some form of segregation such as roadside cycle tracks, minor country lanes and so on. In our submission we argue that the concept of a Greenway Development Strategy is fundamentally flawed and misconceived and so should be set aside. What is needed is a national strategy and program for the delivery of Objective 3 of the National Cycle Policy Framework (NCPF). For rural recreational cycling and cycling tourism the underlying policy context is Objective 3 of the National Cycle Policy Framework (NCPF): Signed rural cycle networks for tourism and recreation. This section of the NCPF was aligned with the previous 2007 Fáilte Ireland Strategy for the Development of Irish Cycle Tourism. The vision of both documents was for a National Cycle Network based mainly around low traffic rural roads and some greenways. Greenways were to obtained using obvious features such as canal towpaths, disused railways and so on. Segregated roadside cycle facilities would also be needed close to towns to keep cyclists away from heavy traffic that could not be avoided on busy corridors. However away from towns these corridors would be avoided. Failte Ireland document states explicitly that busy R and N roads are to be avoided “Generally due to high traffic levels and high speeds we wish to avoid cycling on N or R-roads”. This is a model that has worked successfully for decades in Galway and elsewhere. Galway is Ireland’s best example of a highly succesful cycling tourism experience based on unsegregated cycling on minor rural roads. Every year thousands of visitors come to Galway, hire bikes, and use them to explore a local area. Some of the visitors are clearly people who may not have cycled since childhood. Even so they manage to hire bikes and cycle on local roads shared with local motorists and farm traffic. It is a model that has run successfully for decades and many of our happy visitors put up videos on you tube. This all happens on the Aran islands. 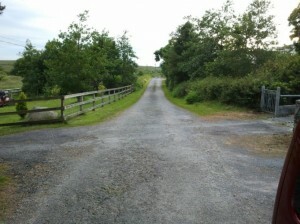 Physically, there is nothing special about these roads compared with many other country lanes in Galway. What makes this cycling possible on the Aran Islands, is that the motor traffic is only local residents and farmers. The only thing stopping a similar experience elsewhere in Galway is a refusal by state actors to accept that it is possible to manage local roads for the benefit of the local community. Instead there is a destructive attitude that “all roads are there for any driver who wants to use them”. In Germany, the Netherlands and other places there is a different attitude. Local authorities will identify local routes that are not suitable for through-traffic and exclude it. 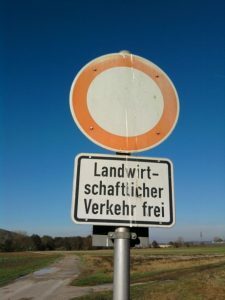 For motor vehicles these roads are then made “local access only“, “residents only” or “agricultural traffic only”. Lower speed limits are also applied. These routes then provide an “Aran islands” like resource for cycling and walking and such routes are the backbone of recreational cycling in many areas. This youtube shows a speeded up view of a section of the Fulda cycle route in Germany. There are a range of route types involved in this video but many of what look like “traffic-free” sections running through fields are actually still open to motor vehicles accessing local properties. These can be seen from time to time parked at the roadside. 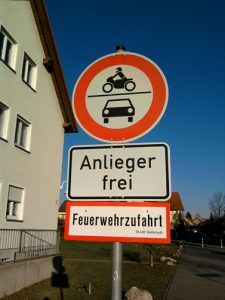 In Germany this sign creates roads open only to local farmers, local residents (anlieger) people on bikes and people on foot. The result is a large network of low-traffic walking and cycling routes and improved quality of life for local residents. Regulations for general control of traffic and pedestrians. 35.—(1) The Minister may make regulations for the general regulation and control of traffic (including the parking of vehicles) and pedestrians in public places. Classification of national, regional and local roads. (1) (a) The Minister may by order classify any existing public road or any proposed public road as a national road. (b) The Minister may by order classify any existing public road or any proposed public road as a regional road. (c) A public road, other than a national road or a regional road, shall be a local road. (ii) divide a particular class of roads into subclasses. 45.—(1) A protected road means a public road or proposed public road specified to be a protected road in a protected road scheme approved by the Minister under section 49 . (2) A protected road scheme approved by the Minister may provide for the prohibition, closure, stopping up, removal, alteration, diversion or restriction of any specified or all means of direct access to the protected road from specified land or from specified land used for a specified purpose or to such land from the protected road. (III) for the purpose of maintaining such protected road. (b) A person who contravenes a prohibition or restriction under paragraph (a) shall be guilty of an offence. Closing of particular roads to vehicles. 94.—(1) The Minister may, after holding a public inquiry, by order prohibit, subject to such exceptions or conditions as may be specified in the order, the driving of vehicles or any class of vehicles on any specified public road in respect of which it appears to him, in consequence of the inquiry, to be proved that the driving of vehicles or the class of vehicles on the road would endanger the traffic thereon or that the road is for any other reason unsuitable for use by vehicles or such class of vehicles. (b) it shall be lawful for such road authority, with the consent of the Commissioner, and shall be their duty if required by the Commissioner, to erect and maintain a sign, either in advance of or at the road, to give indication to traffic of the prohibition provided for by the order, being a sign conforming with the prescribed provisions as to size, shape, colour and character. We are writing to echo the views of Simon Comer from Cosáin whose excellent letter was published on this page last week. He made the point that cycling campaign groups have been tirelessly lobbying for many years for safer conditions for cyclists. 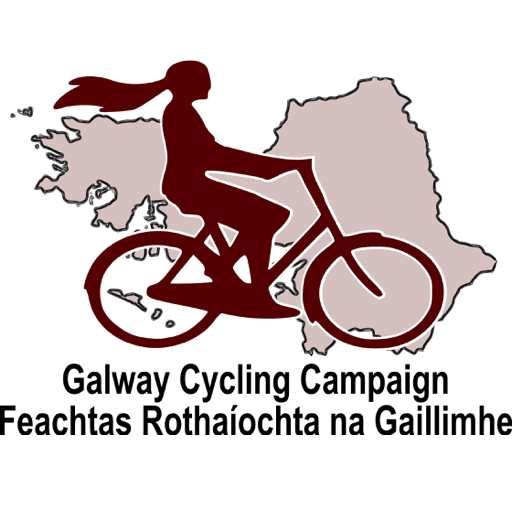 Galway Cycling Campaign, a group made up entirely of volunteers, is one of these groups and has been lobbying on behalf of cyclists for 17 years. We have also contributed hugely over the years to educating Galway’s cyclists. Our ‘Share the Road’ and ‘Cycling Skills’ leaflets have proved continuously popular and have been adopted for use in other cities. Some of our members are accredited cycle instructors, and deliver training sessions to adults. We do not have a statutory role in enforcing traffic laws or in implementing government cycling policy. We are all too aware, especially this week – National Bike Week – that cyclists are vulnerable road users, and will come out the worst in collisions with vehicles. Mr Tierney declares that the GCC should “embark on a learning curve.” We however believe that it is Mr Tierney himself who is in need of the learning curve. He is quick to condemn cyclists, and fails to understand why cyclists are using pedestrianised streets at all. Cycling is now enshrined in national government policy, as outlined in Smarter Travel and the National Cycle Policy Framework. Galway City Council has a role in promoting cycling and providing adequate facilities. Cycling infrastructure in the city is simply not good enough. The existence of a one-way system in the city centre results in cyclists being forced into pedestrian areas. Allowing cyclists to move both ways on a one-way street is a simple solution to this problem. Our educational materials advise cyclists to dismount in pedestrian areas. Mr Tierney, the next time you see a cyclist on a pedestrian street, ask yourself why they are there at all. And then, instead of suggesting that a resource-poor voluntary organisation provide seminars for the public, think carefully about what specific local and national bodies have statutory obligations to educate the cycling public. Galway Cycling Campaign is calling on all established or budding film directors to submit a short film for its upcoming Bicycle Film Night. The Bicycle Film Night is a much loved and well established Bike Week event and for the first time ever it is making a call for submissions. The submission should be a short film (we are looking for films under 20 minutes but we might consider a longer one if we really like it! ), and for obvious reasons should include some kind of reference to the wonderful world of bicycles. If selected, the films will be screened during the Galway Bike Festival 2015 (13th-21st June) and will be submitted to an audience vote. The deadline is 5 June 2015 so don’t hang around, get filming! Is your film ready to rock? Cycling Campaign welcomes changes to Connemara greenway proposals at oral hearing. The Galway Cycling Campaign has welcomed changes proposed by Galway County Council to the Oughterard to Clifden Greenway at the An Bord Pleanala oral hearing held in Clifden last week. The cyclists had serious concerns about an initial design that would put a recreational cycle-path directly beside high-speed traffic on the N59 for over 11km. At the hearing, held over two days in the Station House Hotel Clifden, the County Council offered an amended design. The new design would use sections of the old railway line and the old Clifden road to provide an additional 6.35Km away from the N59. The hearing heard some opposition from local landowners, particularly from the Bunscanniff and Glengowla townlands. Keith Geoghegan of Glengowla mines expressed serious concerns about possible ill effects on his business but offered an alternative route through his property away from the old railway track. Some observers expressed the view that visiting tourists should be charged a fee to cross individual land holdings. Mr. Liam Gavin, Senior County Engineer, expressed a preference for following the old Clifden-Galway Railway embankment to the greatest practical extent. Local hoteliers and business owners spoke in favour of the scheme. Mr. Paul Dunne, a Lecturer in Tourism at GMIT spoke in favour of placing the route away from the N59 and cited research on feedback from users of the Great Western Greenway in Mayo. Some contributors took an opposing position arguing for the incorporation of the route into the N59 or of dropping the scheme altogether in favour of investing in local roads. Evidence was presented at the hearing pointing out that the incorporation of recreational cycle-routes into roads with high-speed traffic is directly contrary to both the 2007 Failte Ireland Tourism Strategy and guidance from the National Trails Office. According to the cyclists, the overall proposal to develop a 50km Greenway from Oughterard to Clifden, and costed at EU7million, is welcome. If sensitively carried out, the scheme could create a huge asset for the community of West Connemara. They point out that the Western Greenway in Mayo has generated EU7million per year for the local community – indicating significant unmet demand for a particular cycling experience. An Bord Pleanala recently rejected a Kerry County Council application to put a tourist cycle route directly beside the N86 on the Dingle Peninsula. The Cycle Campaign is hopeful that the eventual Board decision on the Galway greenway may identify further sections of the route that can be taken off road. Even with the changes proposed, 5.15km will still be right beside the traffic on the N59. Campaign says rejection of controversial Kerry Cycleway proposals good news for Connemara Greenway. The Galway Cycling Campaign and Cyclist.ie, Ireland’s National Cycling Lobby Group has welcomed An Bord Pleanala’s rejection of a controversial NRA Cycle path scheme for the N86 in the Dingle peninsula. The road scheme running from Camp to Dingle had attracted particular concern because the designers planned to co-locate a tourist cycling path directly beside high speed traffic for the entire length of the N86 scheme (28km). The rejection of the Kerry proposals echoes concerns raised about the proposed Connemara Greenway which is due to go before an Oral hearing next month in Clifden. The cyclists are hailing the decision as a vindication of the Failte Ireland tourism strategy and National Cycle Policy Framework which is to avoid busy roads. The Galway Cycling Campaign has lodged an objection to the proposed Connemara Greenway on similar grounds: that the cycle paths are placed directly beside high speed traffic for considerable distances alongside the N59 despite the existence of obvious alternatives. With regard to similar cycle paths in Kerry, the Planning Appeals Board have instructed that they be dropped from the scheme. The grounds given include that the proximity to the carriageway might not offer an attractive recreational route. The Board recommends that alternatives possibly using quieter non-national roads would deliver a more desirable and successful cycleway. The Board have asked the applicants to resubmit a scaled back scheme that seeks to minimise interference with natural features such as hedgerows and tree lines. An Bord Pleanala to hold an oral hearing into the proposed Connemara Greenway on the 11th of December. The proposal to develop a 50km section of the Connemara Greenway from Oughterard to Clifden is welcome. If sensitively carried out, the scheme could create a huge asset for the community of Connemara. They point out that the Western Greenway in Mayo has generated EU7million per year for the local community – indicating significant unmet demand for a particular cycling experience. However the cyclists say that the current scheme is incorrectly conceived, could fail to achieve its aims and could divert significant resources from more beneficial works. The planning appeals board has been asked to reject the scheme in its current format. Over the entire 50km, long sections of the proposed scheme conform to the commonly accepted “greenway” concept (i.e. it is routed away from high-speed traffic). However, instead of being maintained as a traffic free greenway for the greatest possible distance, the route is to be incorporated into the existing N59 as a cycle path adjacent to fast moving motor traffic for between 11.7 and 14.6 kilometres or approximately 20% of its length. In the EIS carried out for the scheme, the alternatives to incorporating the cycle route into a high-speed road do not appear to have been given due consideration. Nor does any due consideration appear to have been given on the impacts of such traffic on cyclists – who will theoretically include family groups. Most regrettably, the worst affected section of the route could be considered the most scenic as it passes close to the Maamturks mountain range and the South Bens. It is imperative that an off-road solution be found here so that, rather than being 2meters from vehicles travelling up to 100km, users can fully enjoy and appreciate the spectacular scenery in piece and quiet. The Cycling Campaign has identified various alternative options that fulfil the greenway model. These include sections where the old Galway to Clifden railway bed is still available and sections of parallel minor roads including the original Galway-Clifden road. The alternatives provide a route away from high-speed traffic where the full benefits of a world class cycling route could be provided. In addition to providing a much more attractive route the alternative proposals avoid the need to CPO lands along the N59 itself.